Miron glass is considered the ultimate in glass packaging by holistic practioners and nutritionally aware shoppers. It's also beautiful. So please recycle your bottles... you can wash them out with repeated washes of hot soapy water and rinse well. Let them dry in the sun or a warm airing cupboard. Bingo, you're good to go. 2. If you make your own St Johns Wort/Mullein or Calendula oils, you can store them in here. 3. If you use the oil cleansing method you can use this bottle to hold your mixture. 4. Would be perfect to store flower remedies in here. 6. Do you make elderberry syrup? Well a perfect bottle for that! Email me for an easy recipe. I see the start of some early berries in Devon - won't be ripe for picking until October though. 7. Mini portions of Kombucha? Or aloe juice? 8. Give them to somebody who makes herbal medicine. If you don't know anybody, donate them to a charity/thrift store. 9. 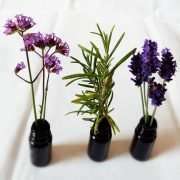 Use as flower vases.. perfect for single stems. 10. Use to store premixed inks for painting. There must be loads more ways, be creative. I have had a twelve year love obsession with biophotonic dark violet made by MIRON. I've kept and reused a cream jar for almost ten years, only having to replace the dark glass lid (which traps cream under the liner, yetch). I use this little pot for storing experiments, it's been in and out the dishwasher dozens of times and looks as good as new. What does Miron glass do? Do you remember shining a light through a prism in science lessons? Visible light gets split into a rainbow of colours as it passes through. Well the Violet glass blocks out red, orange, yellow, green, blue visible light which causes degradation. During the middle ages, the alchemists, the early chemists, were aware of the power of violet glass to protect and preserve substances - the odour, colour, texture and potency. Even the Ancient Egyptians used to use violet or gold containers to store precious healing substances. In 1995 a Swiss company began to manufacture violet glass again, through an expensive patent protected process. Independent scientific tests have shown the power of MIRON to preserve chives, tomatoes, spirulina algae, rose water, homeopathic and Bach flower remedies. My dream face cream bottle would be airless violet glass - which they don't make (I've asked the CEO several times). I didn't want fingers poking into my face creams where the aloe vera juice, rose water, vitamins and hyaluronic acid are like cake and chocolate to harmful bacteria, fungi and mould. So this is why Heart of Eternity is not in Miron. No fingers poking about in precious actives, thank you. It preserves products for longer - all those organic nutrients remain more vital. Please still store your products cool and dark. And if you're a formulator, you'll still need a preservative system for ALL water based products if you're planning on selling them to the public or gifting them to friends or family. Last thing, sign up for the Glow Skincare newsletter, it's almost weekly. Moisturiser without palm oil? Mission Impossible? What does the e-symbol mean on Cosmetic labels?